Name: Ram Ramkit Rampaw Ram??? Appearance: A bulky brown tabby tom with orange eyes. 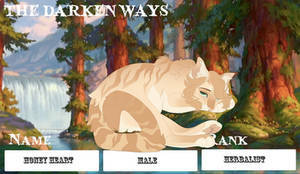 - His parents, Buck and Doe, were wandering loners near the territory of RiverClan. - They hadn't planned on being parents, so Doe raised her kits--Ram, Ewe, and Wooly--alone. 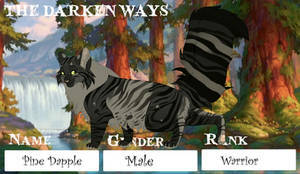 - Ram wandered a bit too far from her, following a butterfly that happened to land near RiverClan's border. - Taken in around the same time that Lionsnap's kits are born. Name: Dead / Missing ??? [NPCs] Ewe, Wolly, Doe and Buck / - He doesn't know who they are, and neither does anyone else. a baby ;A; do you want to rp with Emberkit?